Best in Show, a painting by Chantelle Norton. "I do have this mixed feeling; a little bit of a fear of dogs, while loving them at the same time," reveals Chantelle Norton. Her oil paintings of dog paws now appear at the Theo Ganz Studio in Beacon in a show titled "Dog Days." 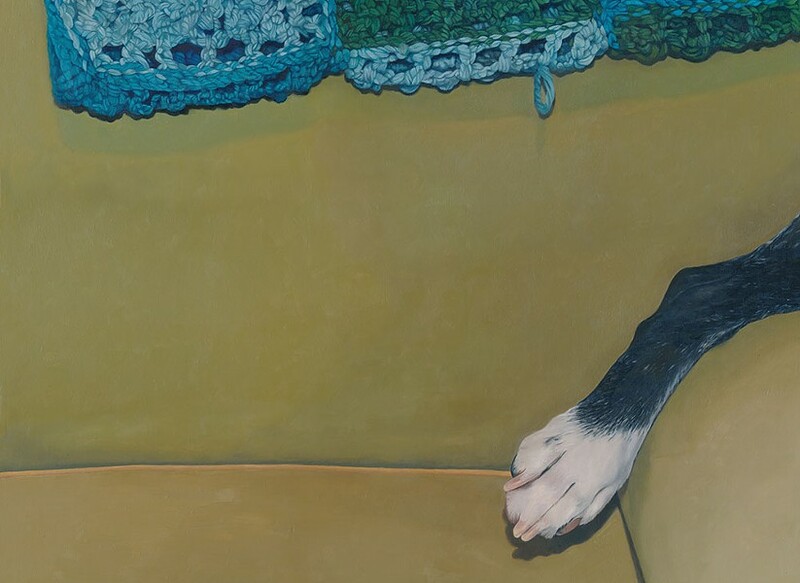 As far as I can tell, these are the only close-up paintings of dog paws in art history. All the paws belong to the same dog: Lulu, a Boston terrier whom Norton adopted in 2013. This was, in fact, the first dog Norton owned, the one who taught her the visual language of canines. Lulu died a year and a half ago—after Norton had begun these paintings. Each of the images leads the eye beyond the frame, to an absent creature we never see. In this sense, they are pictures of loss. "Dog Days" also conveys the disturbing moment when you awaken from a deep sleep, look across the bed, and can't decide if you're seeing your dog's hand or your husband's paw. Paw with Dancers, depicting a white paw against a textile pattern of women dancers, offers an important clue to this work. The gestures of resting dogs resemble still photographs of choreography—with the same drama and elegance. Of the 14 paintings, about half show front paws, half back paws. The titles are often playful: Dog Day Afternoon, Let Sleeping Dogs Lie, Hair of the Dog, La Pause. A similar whimsy influences their composition. The dog feet are seen against various backdrops, some of which border on the absurd. The Chase shows an idle dog paw resting on a sheet with a pattern that might have originated in a Boy Scout manual: two cartoon hunters pursuing their quarry on horseback. At one time, dogs raced through the forest, helping our forebears hunt wild animals. Now they laze in beds. Or fall asleep and dream of "the chase." Also, one notices how clean dogs' feet are! None of the linen is soiled. Dogs are, nowadays, often cleaner than people. Two central pieces may be seen as a pair: Night Paws and Dawn Paws. (In fact, they hang side by side.) Night Paws is a solemn closeup of two white dog mitts against a black background, set in an elaborate, ornamented wooden frame subtly emphasizing the painting's affinities with Rembrandt. Dawn Paws shows the same canine appendages on a white sheet with ribbon-like stripes. "Somebody last night at the show's opening was talking about Dawn Paws, how everybody who has a dog knows that gesture: paws touching each other in a prayer-like way," recalls Norton. "Every dog does it." "Dog Days" also contains drawings of 56 dog breeds, taken from images of friends' pets, dogwalking strangers in the street, and dog breeding websites. (There's even a full portrait of Lulu.) The back wall of the gallery is covered with wallpaper Norton designed based on a legend of Artemis, Greek goddess of the hunt. Actaeon was a hunter who spied on Artemis bathing naked in her secret grotto. The goddess, enraged, transformed the interloper into a stag. Failing to recognize him, Actaeon's hounds hunted him down and killed him. Dogs can be our servants and also our murderers, Norton's wallpaper reminds us. The design—which has a title, The Pack II—includes images of Hudson Valley scenery taken from a 19th-century art journal given to Norton by her father. The wallpaper is 13 feet long, and took five hours to install. "It acts like a magnet, when people come into the gallery—they just go right to that back wall," observes Eleni Smolen, director of the Theo Ganz Studio. "Dog Days" will remain at the Theo Ganz Studio in Beacon until January 28. (917) 318-2239.